CHICAGO — While the global fracking boom has stabilized North America’s energy prices, Chicago — America’s third largest city and the busiest crossroads of the nation’s railroad network — has become ground zero for the debate over heavy crude moved by oil trains. With the Windy City experiencing a 4,000 percent increase in oil-train traffic since 2008, Chicago and its many densely populated suburbs have become a focal point as Congress considers a number of safety reforms this year. Many oil trains are 100 or more cars long, carrying hydraulically fracked crude and its highly explosive, associated vapors from the Bakken region of Montana, North Dakota, Saskatchewan, and Manitoba. A majority of those trains also cross northwest Ohio on their way to refineries and barge terminals along the East Coast. 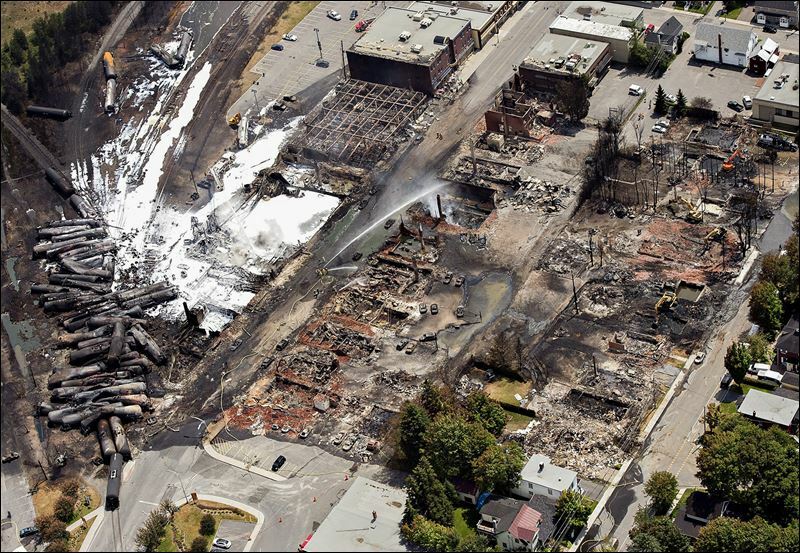 Derailments can lead to massive explosions, such as the one on July 6, 2013, when a runaway train derailed in Lac-Megantic, Que., just across the U.S.-Canada border from Maine. The resulting explosions and fire killed 47 people and leveled the town’s business district. 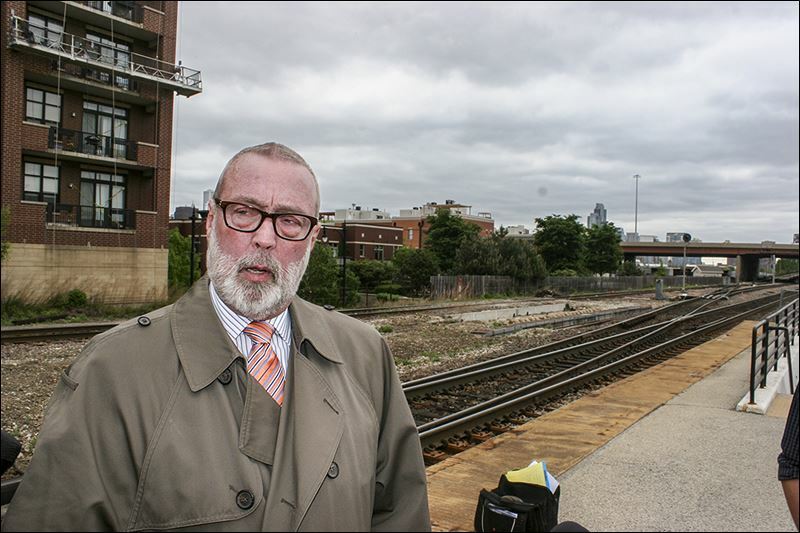 “For me to assure my community there’s no risk, I would be lying,” Aurora, Ill., Mayor Tom Weisner told reporters on the Halsted Station’s elevated platform near downtown Chicago last week. The discussion was arranged by the Institutes for Journalism & Natural Resources, a group that promotes better environmental reporting. “A derailment in or around our downtown would be absolutely disastrous,” he said. One of Chicago’s distant western suburbs, Aurora, with 200,000 people, is the second-largest city in Illinois. Though it has fewer than one resident for every 10 in Chicago (population: 2.7 million), Aurora is somewhat smaller than Toledo, which has 281,000 residents. Mr. Weisner, whose mayoral office overlooks tracks where many of the oil trains pass going toward Chicago, shrugged when asked about emergency planning. “That always helps, of course. But you could have a major catastrophe before they could arrive on the scene, and that’s the truth,” Mr. Weisner said, noting the Lac-Megantic explosion on at least three occasions. Closer to home, he said, are memories of a train explosion on June 19, 2009, in Cherry Valley, Ill., just outside Rockford. Although that derailment involved a train carrying flammable ethanol — not an oil train — its fire killed a motorist stopped at a railroad crossing, injured seven people in cars plus two firefighters, and forced the evacuation of 600 homes. On March 5, 21 cars of a 105-car BNSF Railway train hauling oil from the Bakken region of North Dakota derailed in a heavily wooded, rural area outside Galena, Ill. The train erupted into a massive fireball 3 miles from a town of 3,000 people in the northwest corner of Illinois, near the Iowa and Wisconsin borders. No deaths were reported from that incident and, like several other derailments that have resulted in explosions and fires in recent years, it occurred in a rural area. Mr. Weisner and others fear it is a matter of time before a much higher-profile incident occurs in Chicago or some other big city where the death toll could be significant. Shortly after he finished, an oil train moved past Halsted Station, whose tracks are flanked by high-rise apartment buildings. Oil trains move throughout the Great Lakes region after getting filled with Bakken crude, often ending up on the East Coast. Chicago and the rest of the Great Lakes region is “the heart of the country,” Mr. Weisner said. “We’re always going to be at one of the highest levels of exposure,” the Aurora mayor said. “There’s no doubt about it. 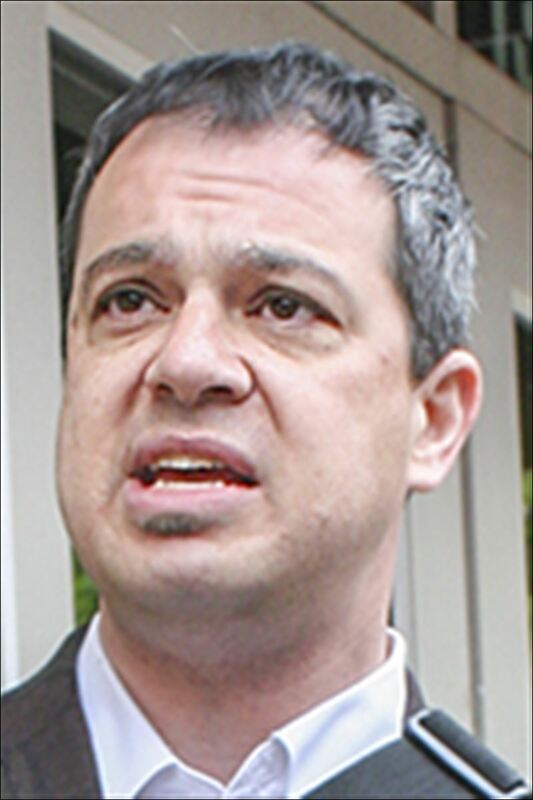 Environmental activists such as Josh Mogerman, spokesman for the Natural Resources Defense Council’s Great Lakes regional office in Chicago, put the risk in more graphic terms. 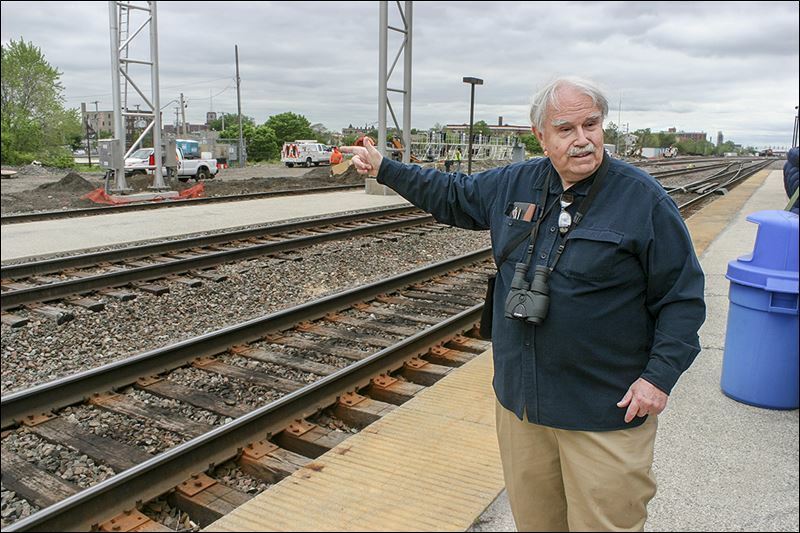 “Welcome to the Bomb Train Capital of America,” he told reporters outside a coffee shop at West Maxwell and Halsted streets, three blocks north of the train station where Mr. Weisner would speak moments later. Tony Phillips is an artist who lives in a condominium adjacent to Chicago’s Halsted Station. He said he can hear “the rip of noise” and feel his building shudder as oil trains come by, often in the wee hours of the morning. He said he feels a “slosh effect” in the flooring from the oscillating weight of crude if he gets up in the middle of the night. “That’s a little spooky,” Mr. Phillips said. He and others want reforms, tighter rules, and more robust train cars, if nothing else. Some efforts are being made through tighter regulations, but critics claim they’re either not enough or being phased in too slowly. Lora Chamberlain, spokesman for Frack Free Illinois and a new coalition called Chicagoland Oil By Rail, said vapor removal should be on the list of priorities to help mitigate the risk. In 2013, America moved 8.3 billion barrels (348.6 billion gallons) of crude oil via pipeline — nearly 29 times the 291 million barrels (12.2 billion gallons) moved by rail, according to data from the Association of Oil Pipelines and the Association of American Railroads. Safety experts see North America at a turning point because of the oil and gas industry’s rapid increase in hydraulic fracturing of shale bedrock, a process commonly known as “fracking” that the U.S. Energy Information Administration predicts will remain strong for at least the next 30 years. Fracking has occurred commercially since the 1950s. The game-changer occurred less than a decade ago, when a technique developed to combine horizontal drilling with fracking made it economical to go after vast reserves of previously trapped oil and natural gas worldwide — including in eastern Ohio and western Pennsylvania, where the Utica and Marcellus shale regions meet. 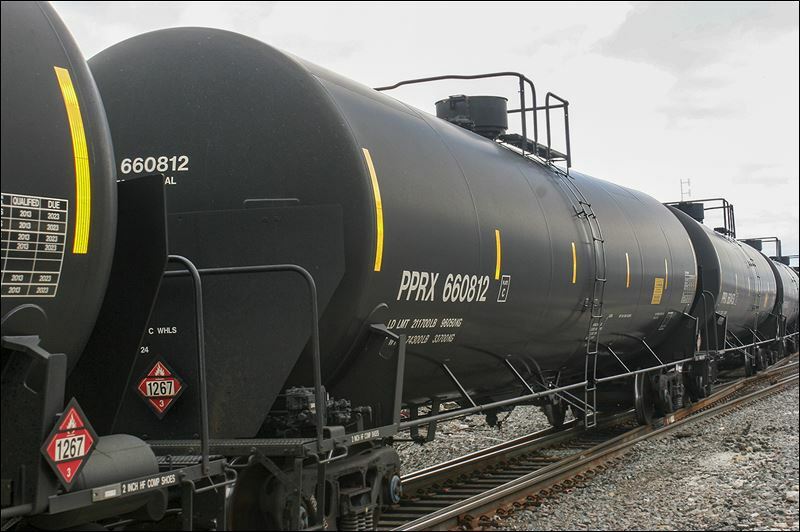 Railroads moved 493,126 tank-car loads of oil in 2014, a nearly 5,200 percent increase over the 9,500 tank cars that hauled oil before the fracking boom began to hit its stride in many parts of North America in 2008, according to the U.S. Department of State. Before the fracking boom, rail shipment of crude was rare and generally confined to a few isolated corridors where pipelines hadn’t been built. Overall domestic crude production has risen 70 percent during that same period. U.S. Energy Information Administration figures show domestic oil produced at a rate of 8.5 million barrels a day in 2014, up from 5 million barrels a day in 2008. This year, crude is expected to be produced at a rate of 9 million barrels a day, just shy of its peak rate of 9.6 million barrels a day in 1970, according to the Energy Information Administration. In its 2015 forecast, the Association of American Railroads contends railroads “are making Herculean efforts” to improve “an already safe nationwide rail network” now crisscrossing some 140,000 miles of the country. The trade association said freight railroads plan to spend a record $29 billion in 2015 — a staggering $3 million an hour or about $79 million a day — to rebuild, maintain, and expand America’s rail network. Much of the money will go toward new equipment and locomotives, new track and bridges, higher tunnels, and newer technology. Freight railroads are expected to hire 15,000 more people this year, continuing its upward hiring trend for an industry that employs 180,000 people, the association said. While considering safety reforms, Congress must ensure that “any changes to public policy still allow railroads to continue private infrastructure spending and other network investments needed to meet customer demand,​” the industry group said.